Do you know that the first hotel in the world was founded in 705 AD? The Nisiyama Onsen Keiunkan situated in Yamanashi, Japan, has been operating for over 1,300 years and even made its way into the Guinness Book of Records as the world’s oldest hotel. Since that time, hotels of all kinds were opened all over the world and many of them are really amazing places with their own unique atmosphere. Bright Side gathered 21 of the most astounding places that are definitely worth spending your next vacation at. This small hotel is home to a herd of endangered Rothschild giraffes that regularly poke their long necks into the windows in search of treats from the guests. Situated in a national park, this unusual resort helps you disconnect from the outside world and reconnect with nature by staying in one of the various treehouses. Being a part of an ingenious floating structure, one of the most stunning rooms of this hotel is located underwater. So when staying there, you can enjoy the marine life and observe fish gliding past your windows. This fantastic volcano-like hotel is hidden away in the center of a huge private nature reserve and erupts water instead of lava. It’s accessible only by foot and its guests must be brave enough to cross a swinging rope bridge to enter it. This innovative hotel consists of habitable plastic bubble domes and allows you to get the dreamy experience of sleeping right beneath the stars. A massive 2-story villa located in an eco-resort offers tourists a chance to stay inside the world’s largest elephant. Besides that, you can explore the surrounding landscape and see real elephants nearby during the day. Also known as the “Crazy House,” this extraordinary building is a piece of artwork that surpasses all the limits of human imagination. Its designer, Vietnamese architect and impressionist Đặng Việt Nga, used non-rectilinear shapes, twisting organic forms, and uneven windows to construct a real fairy tale house open to everyone. These Lord of The Rings-inspired rooms are built with recycled and natural materials. When staying there, you can enjoy the atmosphere of your favorite film series and experience the peace and quiet of a hobbit’s life. This meticulously detailed refurbished 1965 Boeing 727 fuselage suite jets out right from the jungle canopy. It is perched on a 50-foot pedestal which allows you to enjoy astounding scenic ocean and jungle views. Carved from the natural rock and stone of Cappadocia, this hotel presents a combination of 6 cave houses dating back to the 5th and 6th centuries. Besides the great historical atmosphere, guests can enjoy picturesque views on balloons over Göreme from the rooftop terrace of the hotel. This exclusive suite offers you the chance to sleep inside a completely transparent luxury capsule secured to the cliffside thousands of feet above the Sacred Valley. Designed by American architect Frank Gehry, this luxurious hotel with its tilted walls, zigzag windows, cathedral-height ceilings, curved maple wood walls, leather furniture, and marble bathrooms creates the impression of a real piece of art. Aiming at providing guests with a comfortable and affordable night’s rest, this hotel is the perfect place for those who are looking for a simple and cheap room to stay over a night in, in the city. This unique car-themed hotel is a real paradise for car enthusiasts from all over the world. There, most of the walls are covered with murals so that guests can dream of living in a racing car game, and the beds and accessories are made out of real cars. This large island hotel venue is the perfect place for those who have gotten tired of noisy city life. Right at the heart of the venue, you can find a lighthouse with floor to ceiling windows that offers a beautiful panoramic view of the seascape. This unusual hotel is the best place for traveling bookworms who love curling up with a good book before going to sleep. Made out of authentic railroad cars, the Aurora-Express is divided into several suites, each of which is decorated to represent a different period in the history of the Alaskan railroad. This hotel is built in the shape of a beagle and known as Sweet Willy among local residents. Inside a 30-foot-high building, guests can find lots of dog carvings and even dog-shaped cookies left on their pillows. 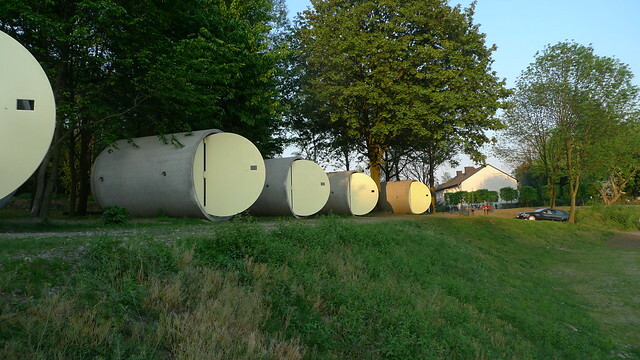 Although the rooms of this hotel are made from old sewer pipes, they have been specially redesigned to give the maximum amount of comfort to their guests in the smallest amount of space. So if you’re really tired of spending the nights in luxury hotels, you should definitely try this one. The world’s first hotel made of ice and snow is a great place to discover silence, take a guided Northern Lights tour, try ice sculpting, experience husky sleighing, or simply enjoy the atmosphere of never-ending Christmas time. Sitting at almost the northern tip of Europe, this resort offers its guests a chance to stay in one of the futuristic-looking glass igloos where they can enjoy the surrounding beauty and admire the Northern Lights. Which of the hotels would you like to visit first? Share your opinions in the comments!